The cut of a diamond (its roundness, its depth and width, the uniformity of the facets) all determine a diamond’s brilliance. We consider cut the most important diamond characteristic because even if a diamond has perfect color and clarity, a diamond with a poor cut will have dulled brilliance. The width and depth will have the greatest effect on how light travels within the diamond, and how it exits in the form of brilliance. Too Shallow: Light is lost out the sides causing the diamond to lose brilliance. Too Deep: Light escapes out the bottom causing the diamond to appear dark and dull. 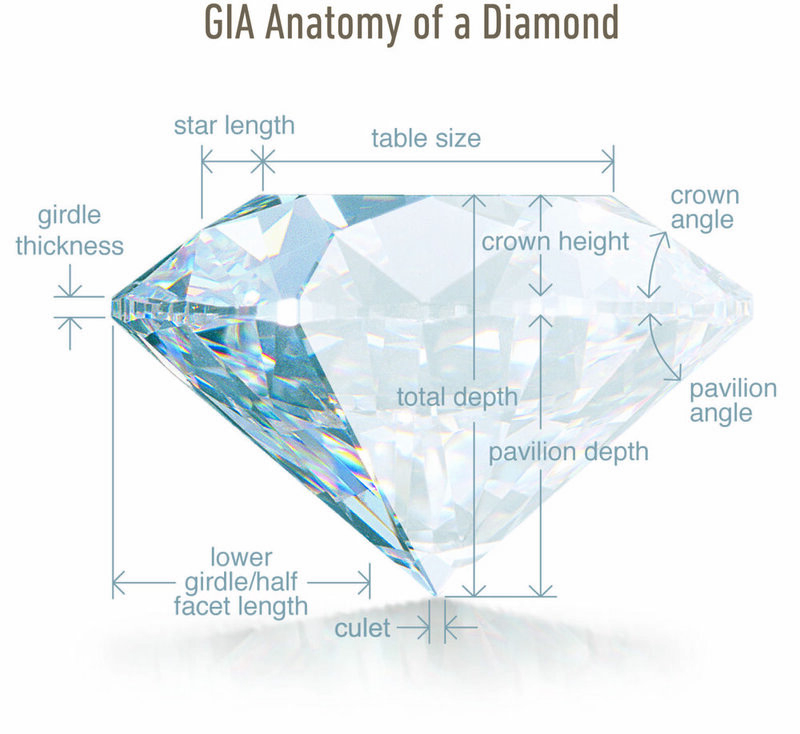 The diamonds proportions, specifically the depth compared to the diameter, and the diameter of the table compared to the diameter of the diamond, determine how well light will reflect and refract within the diamond. Polish and symmetry are two important aspects of the cutting process. 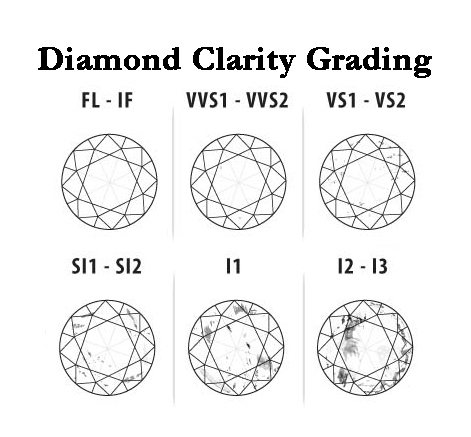 The polish grade listed in many certifications describes the smoothness of the diamond’s facets, and the symmetry grade refers to alignment of the facets. With poor polish, the surface of a facet can be dulled, and may create blurred or dulled sparkle. With poor symmetry, light can be misdirected as it enters and exits the diamond. Acting as a prism, a diamond can divide light into a spectrum of colors and reflect this light as colorful flashes called fire. Just as when looking through colored glass, color in a diamond will act as a filter, and will diminish the spectrum of color emitted. The less color in a diamond, the more colorful the fire, and the better the color grade. While the majority of gem diamonds appear to be colorless, others can contain increasing shades of yellow to brown, some of which are referred to as champagne diamonds. Other diamonds of exceptional color–red, blue, green, pink, and amber–are known as “Fancies.” At Charles Frederick we only stocks colorless and near colorless diamonds. Because of their unique optical properties, diamonds, more than any other gemstone, are capable of producing the maximum amount of brilliance. While minute crystals of diamond or other minerals are contained in almost all diamonds, a diamond that is virtually free of inclusions and surface markings will be judged as flawless. In these diamonds, nothing interferes with the passage of light or spoils the beauty. But these diamonds are extremely rare and will command a high price. To determine a diamond’s clarity grading, it must be examined under a 10x magnification by a trained, skilled eye. What minute inclusions there may be make every diamond unique. These are, in fact, nature’s fingerprints and do not mar the diamond’s beauty nor endanger its durability. Without high magnification, you may never see these inclusions. However, the fewer there are, the rarer your diamond will be. As with all precious stones, the weight–and therefore the size–of a diamond is expressed in carats. “Carat” is often confused with size even though it is actually a measure of weight. One carat is equivalent to 200 milligrams. A carat is divided into 100 “points” so that a diamond of 25 points is described as a quarter of a carat or 0.25 carats. 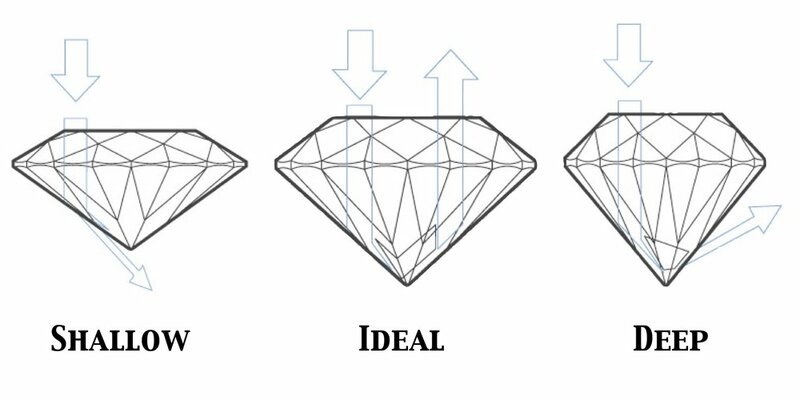 Size is the most obvious factor in determining the value of a diamond, but two equal sizes can have very unequal prices depending on their quality. Since larger diamonds are found less frequently in nature. A 1-carat diamond will cost more than twice a 1/2-carat diamond (assuming color, clarity and cut remain constant). Diamonds have long reigned as the ultimate statement of ardor and affection. The presentation of diamond earrings or a diamond pendant can make a woman’s eyes sparkle nearly as bright as the diamond jewelry itself. It is the most intimate of tokens, a diamond engagement ring will really make her swoon. The hardest, rarest, densest natural substance known to man, diamonds have been a source of fascination (and misinformation) since 800 BC when they were first presented to royalty in India. In those days the Indians believed that diamonds were created when lightning struck rock. Amazingly the sub-continent was the only producer of diamonds for an astounding 2,500 years. As bewitching as diamonds are they have produced more than their fair share of myths over the centuries. They’ve been attributed with increasing potency, preventing lechery, driving away nightmares, counteracting poison, warding off evil, protection from wild beasts, healing sickness and (naturally) attracting good fortune. There’s also the lie detector myth: that diamonds will darken in the presence of a guilty person and brighten in the company of an innocent one; and the magical reproduction legend: that diamonds sprinkled with morning dew and left in the dark can reproduce offspring! If only! Despite these fanciful ideas some of the amazingly real attributes of diamonds include: their age – the first diamond deposits were brought to the surface of the earth approximately 2.5 billion years ago while the most recent deposits are roughly 50 million years old; their hardness – diamonds are so hard they can only be polished by other diamonds; rarity – more than 250 tons of ore need to be blasted, crushed and processed to yield one carat of rough diamond and of that rough, only 20% is suitable for gem cutting; density – diamond is so dense that it actually slows down light to less than half its normal speed – 80,000 miles per second; fluorescence – if you’re in a nightclub and someone’s ears or fingers start to glow then diamonds are most likely the culprit, 30-40% of diamonds glow blue when exposed to ultraviolet light and some will even glow green, yellow, white or (extremely rare) red. While Africa is known as the Diamond continent, it is actually in Australia that the largest reserves are to be found – including the very rare and highly valued pink and red fancy colored diamonds. Diamonds weren’t cut until the 14th century and it wasn’t until 1725 that deposits were discovered inBrazil and it wasn’t until 1866 that South Africa‘s substantial storehouse was unearthed. Diamonds are made of pure carbon atoms that exist deep in the ground, and these are then exposed to intense heat and pressure over billions of years. Over time, this pressure builds up and forces the diamonds and rocks up toward the surface in a volcanic-like explosion. The explosion creates a very deep, wide hole called a “kimberlite pipe” into which most of the diamonds settle. These “pipes” resemble gigantic carrots encrusted with diamonds. It can take years to fully excavate an entire pipe.